Tribhuvan University, Institute of Science and Technology today publishes entrance examination results of B.Tech (Food) Entrance Examination-2075. 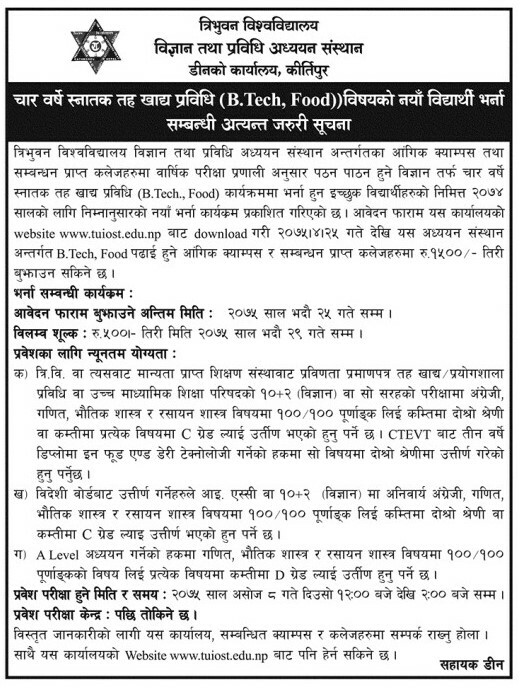 Tribhuvan University, Institute of Science and Technology (IOST) publishes a notice regarding the amendment of entrance exam date and extension of date to fill up the application form for the enrollment in B.Tech Food Technology for the academic year 2075 in its constituent and affiliated colleges. The entrance exam for the enrollment in B.Tech Food Technology is going to be held on Ashoj 12, 2075 at the exam centers mentioned in the notice below. Entrance Examination date: Ashoj 12, 2075 (September 28, 2018) 12 to 2 pm. Currently, 8 Colleges offer B.Tech Food Technology program in Nepal with affiliation from Tribhuvan University. You can find information about colleges offering B.Tech food Technology programs here. To get admission in B.Tech Food Technology students must appear and pass the entrance examination held by TU, IOST.